"But there are so many to choose from." Thanks to reader Steve for this interesting Jerry Potter chat with Padraig Harrington about his thought process in selecting where he will play. Harrington chooses based on whether he enjoys the event, and how it prepares him for a major. He says it is best for him to play just two events in a row leading into a major. The March 20-23 CA Championship at Doral falls three weeks before The Masters. Harrington plans to play the two leading into Augusta National — the Zurich Classic near New Orleans and the Shell Houston Open. 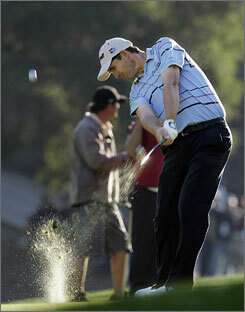 "Maybe if there were half the number of tournaments, then they would be special," Harrington said. "But there are so many to choose from." It is rather amazing that the purse amount means so little anymore. Of course, knowing that players go where they are treated well and the course is good makes you wonder how so many tournaments end up on mediocre courses.